VAIO users with preinstalled SonicStage Software. The Label Print function does not work correctly on the Net MD Walkman MZ-N510/N710 that has SonicStage Ver.1.5 preinstalled and VAIO that has SonicStageVer.1.0/1.1/1.2 preinstalled. 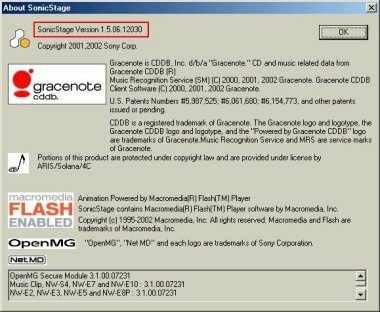 Once the download is finished, please follow the steps to update the SonicStage1.5 on your computer. Type C:\Download\SsLabelPatch.exe in the Open box and click OK. When the following dialog box appears, click Finish. NOTE: *(1) The file name and the messages are for the English operating system. Check the version displayed in the About SonicStage dialog box - If the version is 1.5.06.12030, your SonicStage Ver.1.5 has been updated successfully. You must accept the terms of the End User License Agreement below. After reading this agreement, click on "Download" to begin the download.